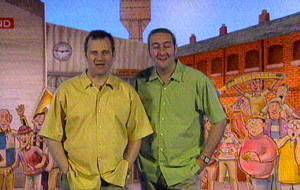 This is Mark & Lard's first TV series for the BBC. It examines football in the 90's. They pair are believed to have been paid £200,000 to do this series. Below are screenshots from the opening credits (in order; left to right, top to botom). In the show they talk about all the important football games of the time, in their own comic manner. They also do interviews with the important football people of the day.